Finely chop the garlic and chillies. Cut off the dry top third of the lemon grass, peel off the outer layer and slice the remainder finely. Alternatively, whizz the garlic, chillies and lemon grass in a processor. Prepare the courgettes, pepper, mushrooms and mangetout and put each in a separate bowl. Mix the tamari, apple juice and lime zest and juice. Meanwhile, in a dry non-stick wok, fry the cheese cubes until golden. Remove from the wok and keep warm. Add the oil to the wok and heat. Then add the garlic, chilli and lemon grass mix. Stir-fry until fragrant, making sure the garlic does not burn. Add the vegetables, courgettes first, then the green pepper, mushrooms and lastly the mangetout, stir-frying for a couple of minutes between each vegetable until just tender but still crisp. Pour over the tamari, apple juice and lime mixture and quickly stir-fry. 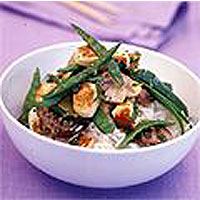 Stir the halloumi back in followed by the coriander, and serve with Thai fragrant rice.